Notably missing from Barrack Obama’s side at the just concluded launch of Sauti Kuu Foundation today was former first lady, Michelle Obama. Barrack, Michelle and their daughters, Malia and Sasha, were in Tanzania for 8 days at the Serengeti where they spent their vacation before Barrack jetted into Kenya. 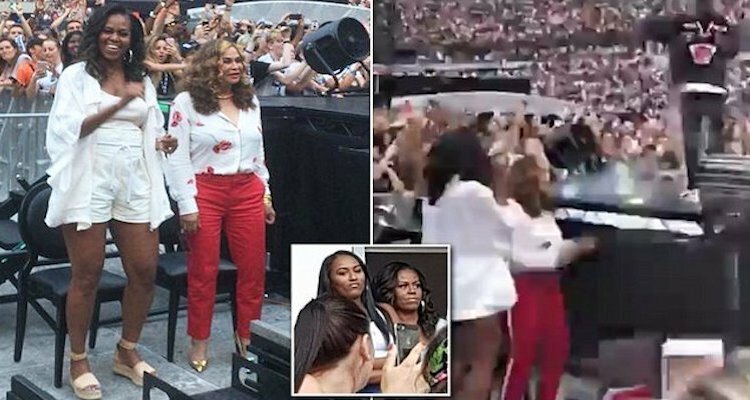 Michelle Obama, together with Malia and Sasha instead flew to Paris to attend Beyonce and Jay Z’s On The Run II (OTR 2) tour after their vacation, while Barrack Obama travelled alone to Kenya. Michelle was seen next mama Tina Lawson on Sunday evening in Paris, enjoying the concert. Sasha, Malia and her boyfriend were also seen hanging somewhere next to them. Some Kenyans were not happy with Michelle’s snub and some have questioned why she is keeping her distance from Kenya since she did not accompany him in 2015 as well. #ObamaInKenya @MichelleObama has been beacon of inspiration to many but her decision to skip Obama's visit to Kenya points to her being among those women who once married in the city would not want to visit the 'mosquito infested' village homes of the husbands. I know michelle hates kenya,She has’nt visited even once. Apenji @BarackObama, you came alone like you are misumba, what is?